I really should stop buying unsubtitled dollar VCDs just because of the cover. But not yet. It’s hard to reconcile the masala excesses of Sivudu Sivudu Sivudu with Khaidi and Sangharshana which were made in the same year. Chiranjeevi is truly a versatile hero! A Kodandarami Reddy directs with his usual ‘nothing succeeds like excess’ flair. The silly story reminded me of why I have such a soft spot for Telugu films. Their commitment to delivering a comeuppance is reassuring and reliable, and something the real world sadly lacks. The VCD quality is poor. It was like watching a movie from the back row in an antiquated cinema while sitting next to someone snacking on cellophane wrapped treats. Among many visual delights, the costume department did their utmost to make an impression with their new discovery – the ruffle. 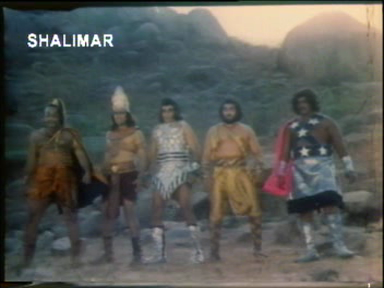 The film opens with Kongara Jaggaiah holding a baby and running from a gang of horsemen. He leaves the infant near a priest, who manages to carry on praying oblivious to the running man and pursuing horses. With the usual filmi total lack of surprise at finding an unattended child, the kindly man raised the baby as his own son. There were two babies in the original shot and the fate of the other child is revealed in due course. The baddies catch up with their prey and he is trampled severely by the horses and left for dead. 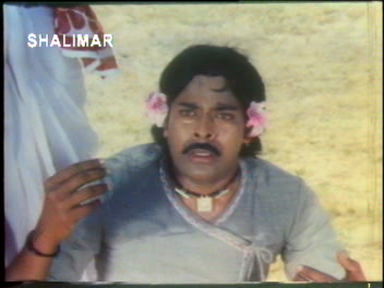 The baby grows up to be Siva (Chiranjeevi). He is a simpleton, spending his days herding sheep, hanging out with his monkey and the village kids. 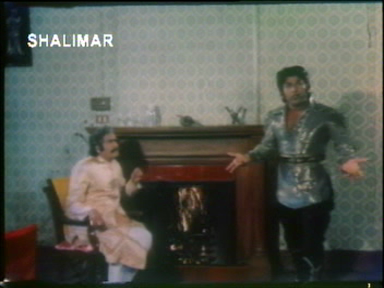 Siva wears very snug fitting clothes – perhaps to show he is an overgrown child or perhaps a precursor to Chiru’s lycra era. He is easily bossed around and has little motivation to grow up or be more independent. Chiranjeevi and the monkey seem to get along well. I think Chiru permanently had a handful of snacks for his tiny co-star and the monkey noshes away happily in most of their scenes. Gauri (Radhika) seems to be the only other person of Siva’s age so they are clearly meant to be together. Gauri is bubbly, smart, opinionated and protective. She makes her feelings clear but Siva is a bit slow on the uptake. He eventually declares his intentions and Gauri thinks her life is set. 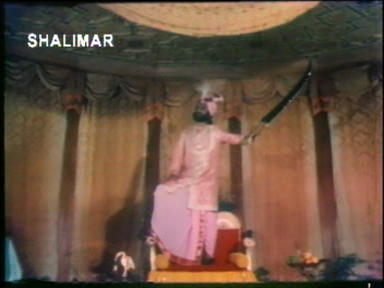 The king (Gollapudi Maruthi Rao) lives in luxury and adheres to traditional excess and appalling interior design. His manager, Rao Gopal Rao, is a nasty piece of work. He and his dodgy son extort money from the peasant workers. Gauri opposes him and tries to rally the people in an uprising. They eventually kill her along with half the village, and kidnap the survivors to work as slaves. The detention facility is one of those totally secret in plain sight kind of places and I doubt the design was all that functional. Anyway. When Siva sees the corpses and carnage he is traumatised. He goes to the king to appeal for justice. 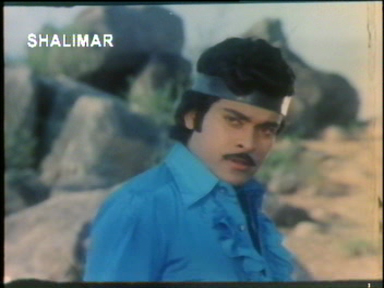 There he sees Malli (Radhika in a dual role), the king’s class conscious spoilt brat daughter. Mistaking her for Gauri, Siva allows Malli to bully and torment him before he realises that this stony hearted witch is not his lost love. It doesn’t happen on screen but I think she killed his monkey. How could you think it’s OK to kill a tiny monkey in a pink dress? Siva retaliates clumsily, and is on his way to the open air jail when he manages to fall hundreds of feet to a safe landing on some rocks. He finds his way to a guru (Kongara Jaggaiah again) and his shrine to Shiva (with affiliated vengeful dude training facility). In a Sholay-ish touch, the guru’s arms dangle uselessly by his side and he is wrapped in a shawl to hide his crippled limbs. There is a flashback explaining his relationship with the overseer and what happened back in the day. He preaches the power of concentration, meditation and preparation as a means to overcome a foe. Presumably he is also of the school of ‘one swift kick’. After a training montage which includes a snippet of learning to dance, Siva graduates to wearing fringed pleather and heads off to seek revenge. 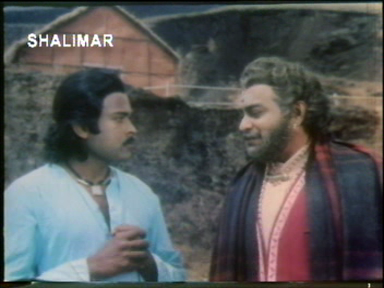 Once again I found myself appreciating how Chiru totally commits to his performances. He may be wearing fluoro bike shorts and not much else but he dances with energy and forcefulness as he prepares to go epic. While out on a hunting trip, Malli is left to fend for herself when a tiger menaces the group. Chiru to the rescue! 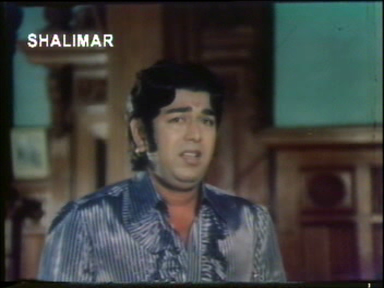 Calling himself Vijay, he joins Malli’s staff as a bodyguard (after a death match competency test) and the ruffled shirt department go into overdrive. Is it any surprise that Malli finds him alluring and irresistible? Radhika and Chiranjeevi do have nice chemistry although this in no way approaches their performances in Aaradhana a few years later. 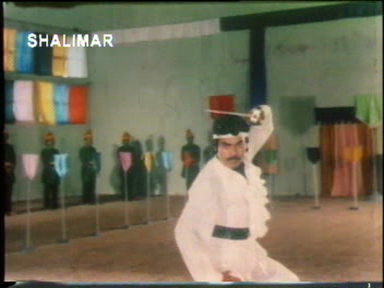 I like the faux flamenco prancing in that song although Chakravarty’s music and the choreography are uninspired. 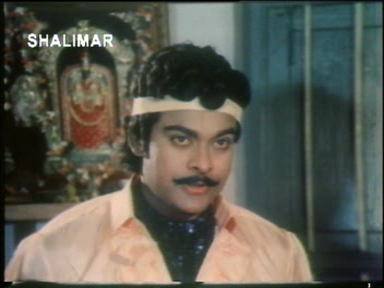 The bouffy mullet is not Chiru’s best hairstyle but it does set off the matching headbands nicely. And yes, dear reader, he is in stylish mega-boots. The overseer and his son favour shiny shirts, and Malli likes a frill or ten so there is something for everyone. Siva/Vijay tells Malli’s servant that her husband is alive but to keep up the appearance of widowhood until the plan comes to fruition. The servant is also Malli’s real mother, something that eventually comes as a shock to the girl obsessed with her pure blueblood heritage. Siva shows her paintings he made of his lost love Gauri, and his monkey, and Malli seems to understand his torment and apologises. I think. (Which is nice seeing as she is partly responsible for his loss.) While I am sure Siva and Malli are not siblings, I am not sure if Siva was the rightful heir to anything or was just a lost boy. Love blooms, revenge ferments and eventually there is a showdown at the secret jail. And there the film really surprised me. I…words fail me. There might be some folkloric element to the basic story but I am not sure what inspired these guys. But good will triumph and evil will be overthrown. And yet again, a surprise as Chiru ripped the intestines out of one villainous henchman using only his bare hands and the righteous power of Shiva. 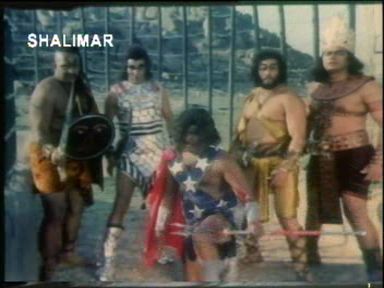 Ah filmi justice – extreme yet reassuringly final. And if you have faith, or maybe unshakable self-confidence, everything will come right in the end. Even if your arms are painted on. This is far from being a good film but it was mightily entertaining. 2 ½ stars for quality, 4 for astonishing outfits! This entry was posted in Tollywood and tagged A. Kodandarami Reddy, Adventures without subtitles, Chiranjeevi, Chiru, Gollapudi, K. Chakravarthy, Kongara Jaggaiah, Radhika, Rao Gopal Rao, Telugu, Tollywood. Bookmark the permalink. Surprise ,Surprise ! You have a new domain name ! Congrats Heather and Temple. This will promote your blog and hopefully let you earn money through ads. 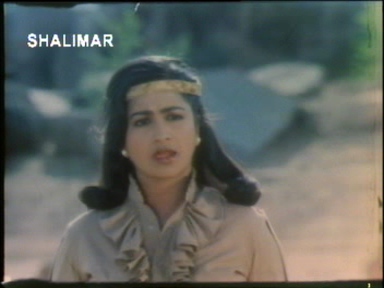 This really is the only review site for old Telugu movies on the internet. I havent come across anything else so comprehensive. Hi – My copy of Sampoorna Ramayanam doesn’t play particularly well so I am yet to watch it through. No intention to monetise the blog actually – it’s more about needing more storage for all the screencaps! Too bad, the youtube version has good quality, though it doesnt have subtitles. I’ll see what I can do to extract subtitles from the DVD and hopefully fuse it with the youtube version. But the problem with the youtube version is that many scenes are cut to make the film short. Try Sampoorna Ramayanam. It has good subtitles. I practically grew up on Sampoorna Ramayanam and Kshana Kshanam. Probably the only movies I remember from when I was younger than 8 years. Temple ji.. maybe you can have a wishlist and ask Heather to get them from Hyd when she visits in Jan.. I have asked a friend of mine to help her.. I think you know her in FB (marapurani chitralu) ..